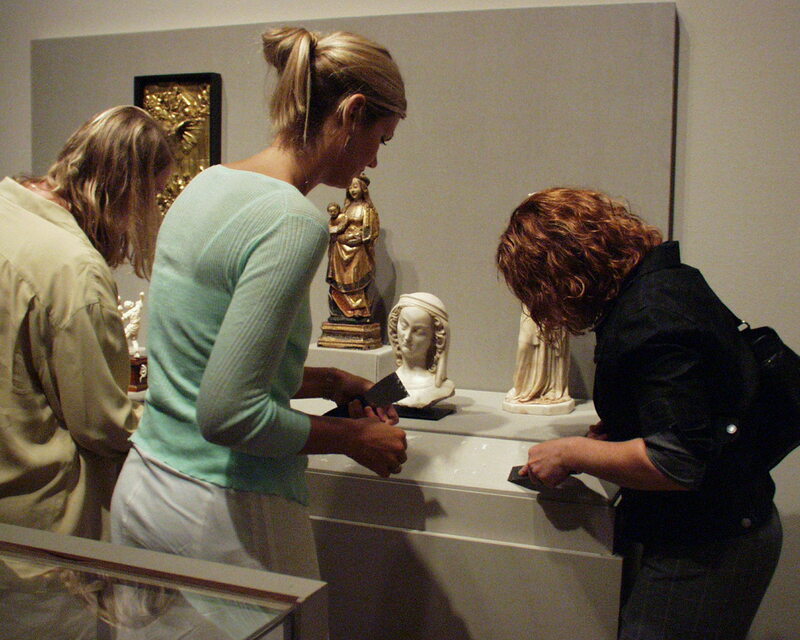 In 2004, interns helped put new labels out in the collection galleries. So much of what we do at the Milwaukee Art Museum depends on volunteers. In the Curatorial department, most of my volunteers are college interns. These dedicated students are willing to give their time and energy to us in exchange for the experience of working at the Museum. Over the past ten years, I have supervised over 100 interns. At times I have had as many as eleven interns at once! Their enthusiasm and intelligence are invigorating. Most interns commit to working 10-15 hours a week for a semester. Sometimes they intern for college credit, but just as often not. I have had interns stay and help me for years after their coursework is done—which is wonderful, because they can work on long-term projects and mentor new interns. This semester, intern Amber Parson helped the Museum’s conservation department prepare for the Summer of CHINA. UW-Madison; UW-Parkside; UW-Stevens Point; UW-Whitewater; Lawrence University (Appleton, Wisconsin); St. Norbert College (De Pere, Wisconsin); Boston University; Calvin College (Grand Rapids, Michigan); Colorado College; Duke University (Durham, North Carolina); Kent State University (Kent, Ohio); New York University; Princeton University; Tulane University (New Orleans); University of Colorado-Boulder; University of Michigan-Ann Arbor; University of Notre Dame; Virginia Tech; Washington University (St. Louis, Missouri). Although most interns are art history majors, that is not always the case. 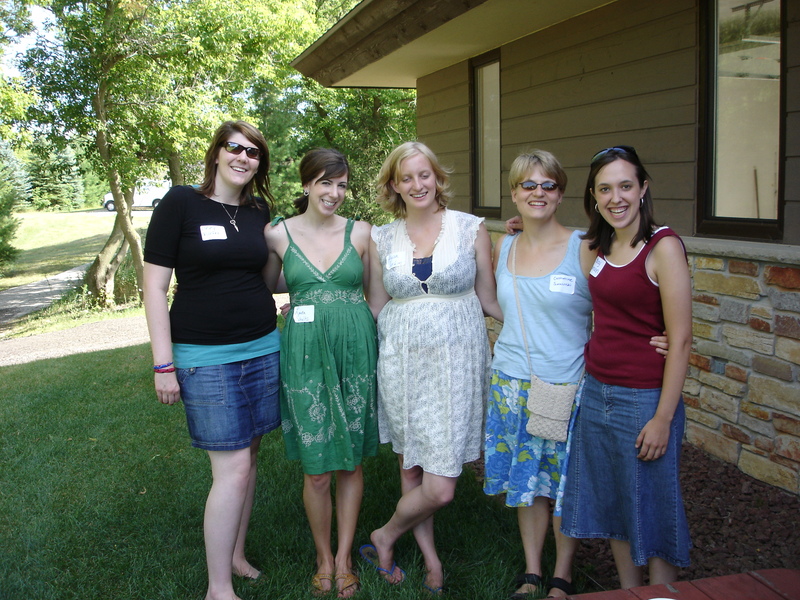 We have seen students majoring in subjects such as English, History, Studio Art, and Marketing. They help with administrative tasks such as mailings and copy documents for meetings. They design flyers and make nametags for events. They help at lectures and parties by greeting guests and answering questions. 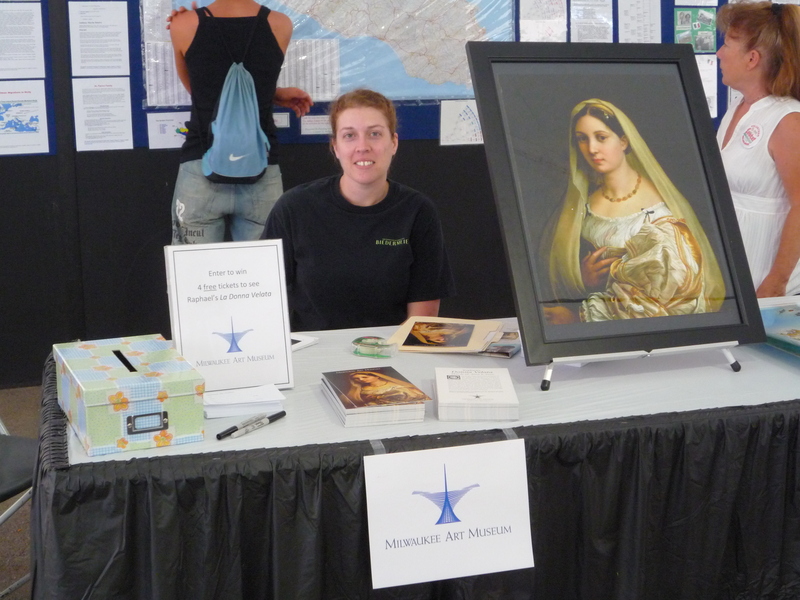 Stephanie McBride spreads the word about Raphael’s Woman with the Veil at Festa Italiana in 2009. They sit at tables at summer festivals to promote upcoming exhibitions. Current intern Courtney Books enters search terms into the collection database. They do research on the collection, compile lists of objects for exhibitions, and fact check for publications. Right now we are conducting a massive effort to enter search terms into our collection database so that when you type in “dog” you get works related to dogs. Who is working on this time-consuming project that requires knowledge of art history? Interns! We couldn’t do half of what we do without their help. This entry was posted in Behind the Scenes, Curatorial and tagged Behind the Scenes, Interns. Bookmark the permalink.